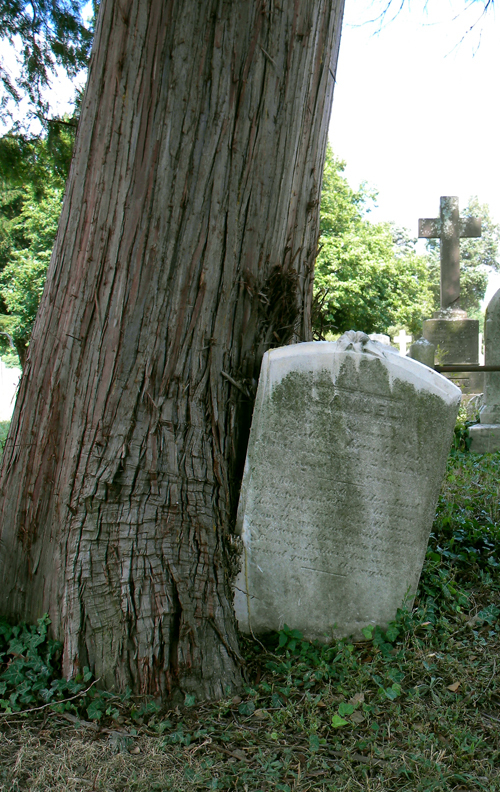 I knew some of the Hambletons of the Hambleton House (now the Bartlett Pear Inn) are buried in Spring Hill Cemetery in Easton, so I ventured over there last week to see who I could find. 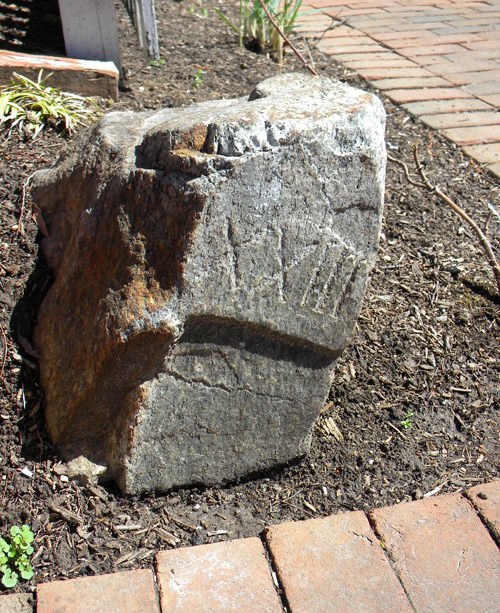 I happened upon the above tombstone for a Samuel Hambleton but when I got home and examined the photos I took more closely, I realized it wasn’t for the Purser Samuel Hambleton or the Col. Samuel Hambleton who bought the house or his son James’ son Samuel. It’s the grave of a fourth Samuel Hambleton! I thank thee, O Father, Lord of Heaven and Earth, because thou hast hid these things from the wise and prudent and hast revealed them unto babes. The phrase above is from Luke 10:21 in the King James Bible. Col. Samuel Hambleton, the father of James and the two sons above, also is buried in Spring Hill Cemetery, but in a different section. Entries for all three are available on FindAGrave. I hope to go back someday and find more of the former inhabitants of the Hambleton House. 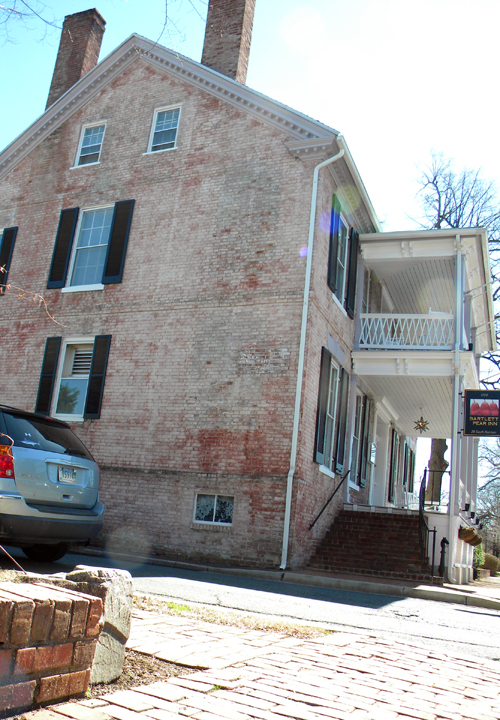 The Bartlett Pear Inn at 28 South Harrison Street in Easton, Md., as it looks today. The building dates back to 1790. Okay, so it’s not mine, nor do I have a photo of it, but I wanted to expand on a part of the Hambleton House story that involves an actual treasure chest! As I mentioned in my blog post about the Bartlett Pear Inn in Easton (formerly the Hambleton House), a small chest was discovered under one of the staircases* in the home after the passing of Nannie Hambleton, the last of the Hambletons to occupy the building. Nannie Hambleton passed away in 1962, 117 years after her father purchased the property. *The innkeeper took me on a tour of the Bartlett Pear Inn when I started working on this project and there are several staircases in the building under which the chest may have been kept. There’s even a staircase to nowhere that was partially walled off during one of the building’s many renovations. You can still see part of it by looking in one of the closets off the main staircase. The chest that was discovered once belonged to her great-uncle, War of 1812 Purser Samuel Hambleton (not to be confused with Col. Samuel Hambleton (Nannie’s father) or Samuel Hambleton III (her brother)). The elder Samuel Hambleton made a name for himself at the Battle of Lake Erie during the War of 1812 by crafting a banner that read “Don’t Give Up the Ship.” The chest found under the staircase at 28 South Harrison Street in Easton contained his personal papers and his medal for bravery. 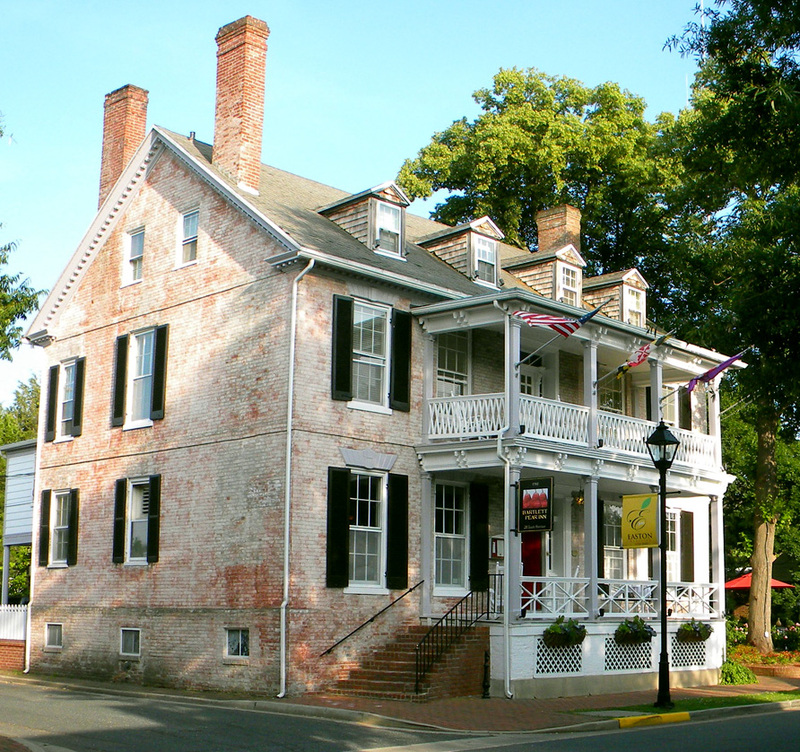 Purser Hambleton later built Perry Cabin in St. Michael’s, Md., which is also now an inn. Perry Cabin is named after Commodore Oliver H. Perry, with whom Hambleton served during the Battle of Lake Erie. 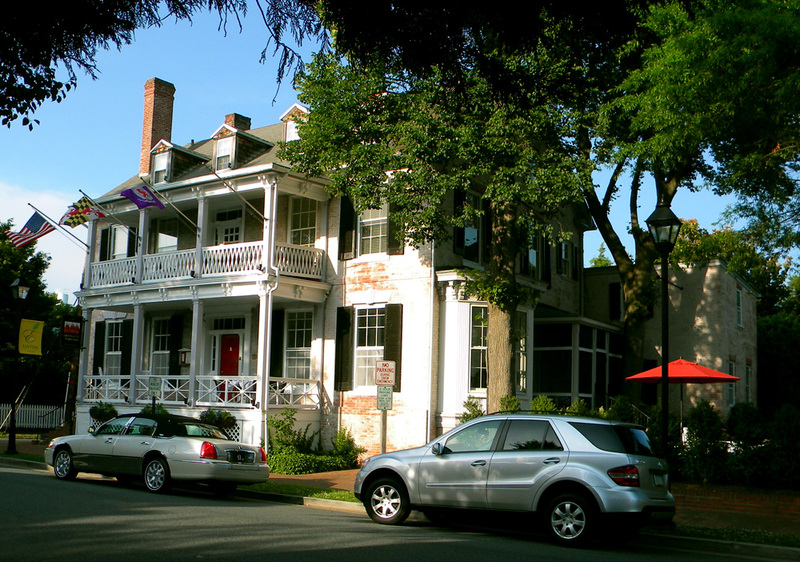 The former Hambleton House (now the Bartlett Pear Inn) at 28 S. Harrison Street in Easton, Md., over time. Click on the images below for larger versions. 28 South Harrison Street in Easton, Md., as it looks today. The building dates back to 1790. Click for a larger image. The building that is now the Bartlett Pear Inn was once one of the grandest homes in downtown Easton. Its storied past includes a U.S. Congressman, a bishop, a love story* and even a treasure chest. There are still further connections to a state governor and a War of 1812 hero. Built in 1790, the mansion was constructed of pink brick by Benjamin Stevens, the son of a prominent Eastonian and the brother of future Governor of Maryland Samuel Stevens, Jr. Benjamin died only four years after completing the house, which then went to his father, John Stevens. John Stevens also passed away a short time later. The house changed hands several times before being bought in 1845 by Samuel Hambleton, an Easton lawyer who would become a U.S. Congressman (1869-1873). He was the nephew of a famous U.S. Navy purser (also by the name of Samuel Hambleton) who played a vital role in the U.S. War of 1812. The house remained in the Hambleton family for more than 100 years. Samuel Hambleton passed away peacefully in one of the upstairs bedrooms in 1886, according to a hand-written account by his son James in a family history book. Col. Samuel Hambleton was a Southern sympathizer and his son James fought in the Civil War for the Confederacy. James was captured at Gettysburg and released from Fort Delaware a short time later. James also was a central player in a love story connected with the property. 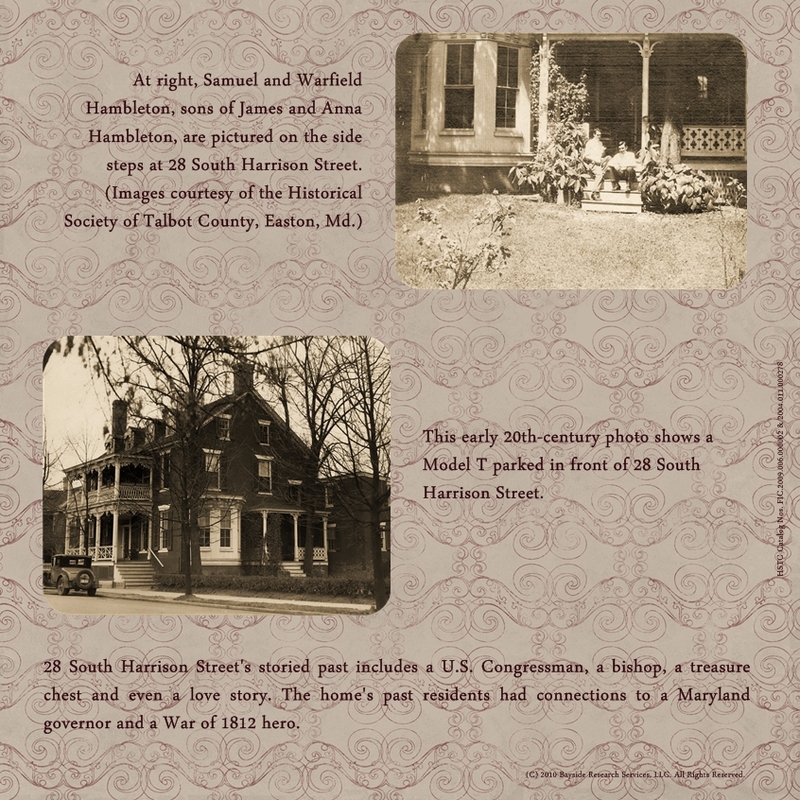 According to an article in the Easton Star-Democrat, James fell in love with Ms. Anna Jones of Howard County, Md., after Anna came to Easton to visit her sister, who lived behind the Hambleton home. “It was quite a romance, it is related, and the engagement was one of the social affairs of Easton at the time,” states the article. 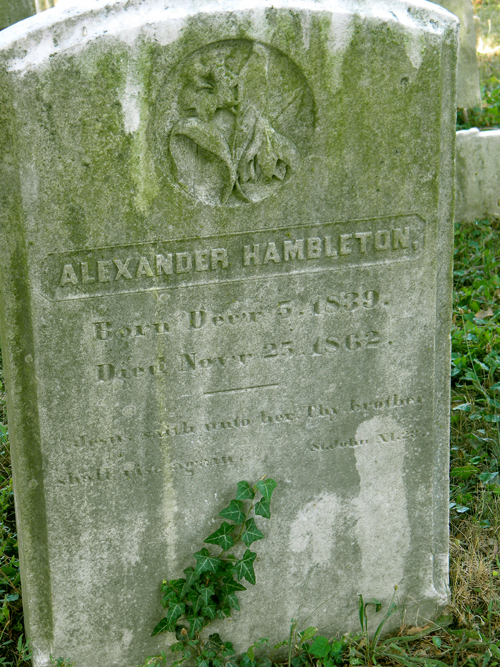 James P. Hambleton passed away in 1888, followed by his wife in 1921. Their daughters, Nannie and Amy, then inherited the property. Nannie, who lived in the home, passed away there in 1962. Shortly thereafter, a small black chest was discovered underneath one of the staircases in the home. It contained the personal papers of Purser Samuel Hambleton and his medal for bravery during his service in the War of 1812. After Nannie’s death, the house left the Hambleton family and was converted into apartments. It was known as the Hambleton Apartments from then until the 1990s, when the building was converted into a bed and breakfast. At one point, according to the Easton Star-Democrat, a Bishop Adams resided on the property shortly after being named bishop of the Easton diocese. This was probably Bishop William Forbes Adams, second bishop of the Episcopal Diocese of Easton, who served from 1887 to 1920. The home as it looks today, as a bed and breakfast. The addition mentioned is visible to the right. The property was included in the 1967 Historic American Building Survey, which described the home as a large, dignified Georgian mansion with very elaborate cornices and crown molding. The survey notes, “The brick work is excellent … It is a fine and well-proportioned structure.” The property at one time had a frame addition used as a law office by the Hambletons, but this was moved across the street before the addition that exists today was built. A huge thank you to the staff at the Talbot County Free Library Maryland Room and at the Historical Society of Talbot County — both are worthwhile stops in Easton. Also thanks to Alice and Jordan Lloyd at the Bartlett Pear Inn for the chance to work on this project! 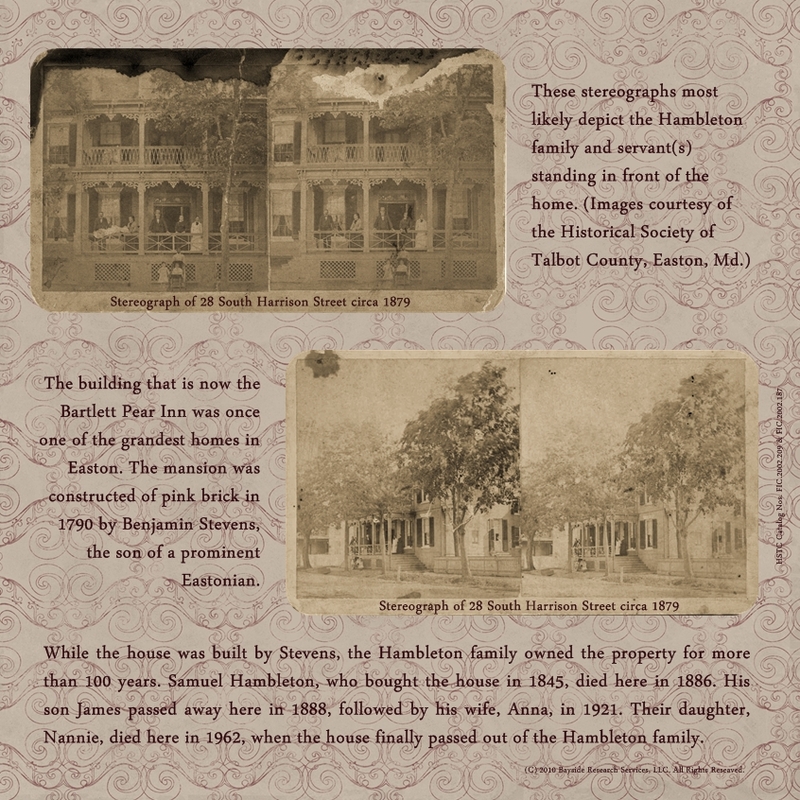 For God and Country — The Hambleton Family of Maryland, September 10-October 30, 1988, The Historical Society of Talbot County, binder: “Family Genealogies Haddaway – Harris”; Maryland Room, Talbot County Free Library, Easton, Maryland. Harrison, Samuel Alexander. 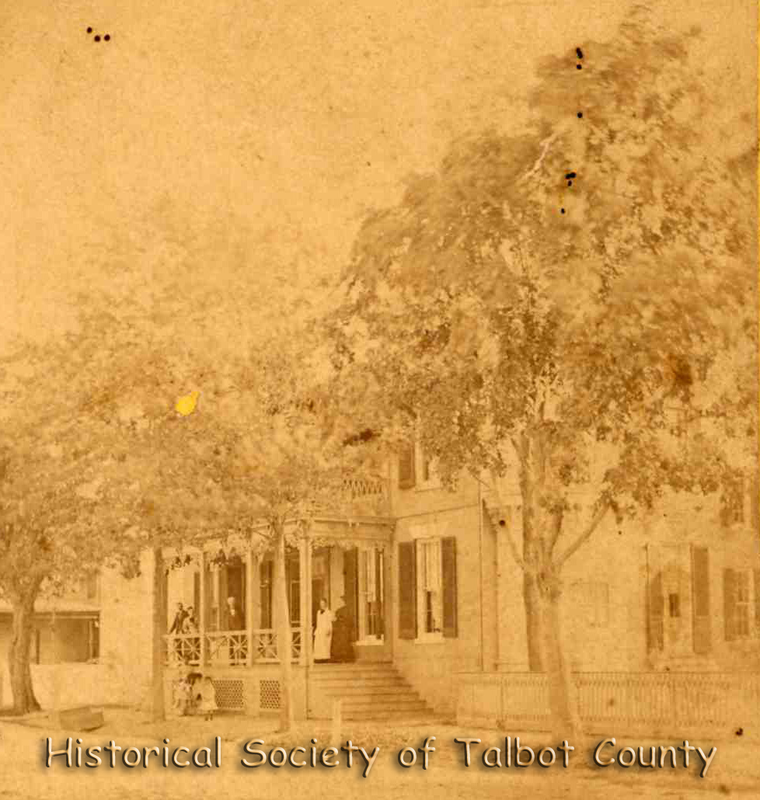 History of Talbot County, Maryland, 1661-1861, Volume 1. 1915. Digital images. Google Books. http://books.google.com : 2007. Historic American Building Survey Inventory, 29 August 1967, folder: “Easton-Historic Houses,” vertical files; Maryland Room, Talbot County Free Library, Easton, Maryland. Ludlow, Cynthia Beatty. Historic Easton. Easton, Md. : Historic Easton, Inc., 1979. Maryland, Talbot County. Land Records. Office of the Clerk, Circuit Court, Easton. Maryland, Talbot County. Will Book 13. Office of the Clerk, Circuit Court, Easton. Maryland, Talbot County. Will Book 14. Office of the Clerk, Circuit Court, Easton. 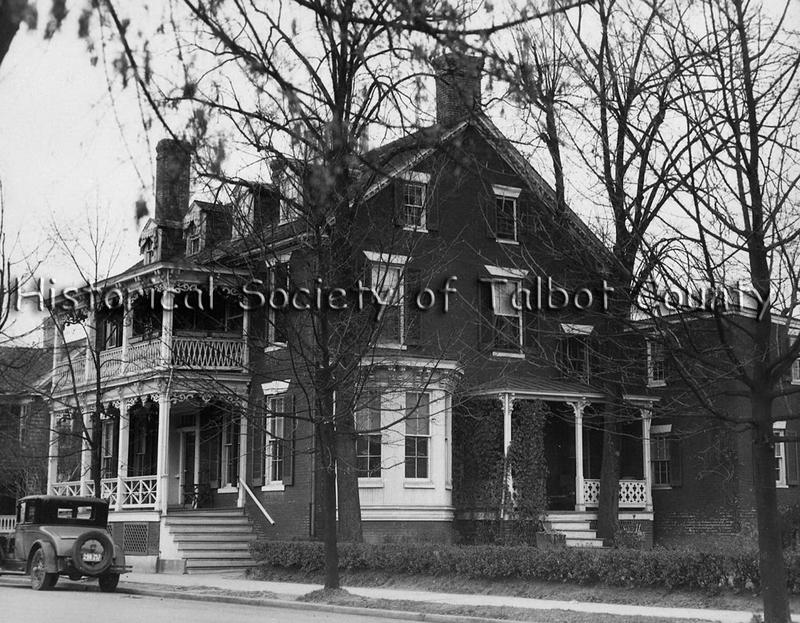 “Some Early Views of Easton Taken Over Half a Century Ago,” Easton Star-Democrat, 23 May 1936; folder: “Easton-Historic Houses,” vertical files; Maryland Room, Talbot County Free Library, Easton, Maryland. The Political Graveyard. Index to Politicians. http://politicalgraveyard.com : 2009. Weeks, Christopher. Where Land and Water Intertwine. Baltimore: The Johns Hopkins University Press, 1984.